UC Berkeley and partner university researchers presented the preliminary results of their two year research project, Career and Life Trajectories of African Alumni of International Universities, at the Comparative and International Education Society annual conference in Washington DC (March 8 – 13). The multi-university retrospective tracer study is supported by The MasterCard Foundation Scholars Program , which is funding 113 comprehensive scholarships for sub-Saharan African youth (undergraduates and MA/MSc) to attend UC Berkeley between 2012 and 2020. The goal of the mixed methods study is to learn about the post-graduation career and life choices of African alumni, and their diverse connections and contributions to their countries of origin (African Alumni Berkeley). A further goal is to reconnect African alumni with their alma mater institutions and with each other for social and professional networking. The project has also created the welcome opportunity for current African students to learn from their “predecessors” on how best to utilize their time at Berkeley to gain the exposure, skills and relationships that will last throughout their life and professional career. They are already connecting for mentoring and summer internships. For example, James Tayali, a public health major and MCF Scholar from Malawi, will be interning this summer with Cal alum, Daniel Kwaro (MPH 2010), Director of Kenya Medical Research Institute, Kisumu, Kenya. Thabani Nyoni, a first year graduate student in Social Welfare, and MCF Scholar from Zimbabwe, will be interning with Cal alum, Dean Peacock (BA 1992), Director of SONKE, a gender justice non-profit organization in Cape Town, South Africa. 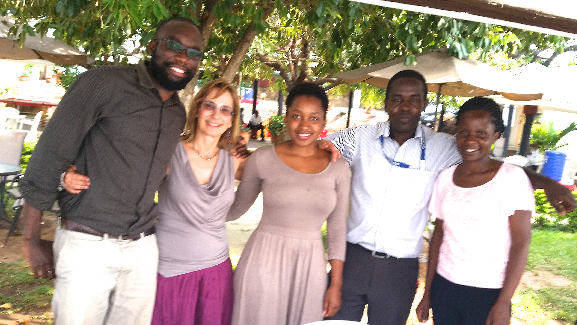 Researchers Robin Marsh & Sidee Dlamini with Kenyan SPH alumni in Kisumu. In January 2015, African Alumni Project researchers Dr. Robin Marsh, graduate student and MCF Scholar, Sidee Dlamini, and Dr. Amy Jamison (Michigan State University) made a historic trip to sub-Saharan Africa to conduct in-depth interviews with alumni from Kenya, Uganda, South Africa and Rwanda. In all, 33 Cal alums were interviewed spanning fifty years since graduation. Each interview revealed fascinating stories of how and why they came to study at Berkeley, their most memorable academic and social experiences at Cal, challenges they faced, and what have been the main impacts on their lives and careers in Africa. In terms of advice for current African scholars at Cal, alums universally urged them to forge strong research and education collaborations with Berkeley faculty and fellow students. These connections have provided a “life line” of support during difficult times politically and professionally in Africa, and provide Cal academics with outstanding collaborators for their Africa-based research projects. At the end of 2014, the study administered a detailed web-based survey to nearly 500 African Cal alumni, (more than 1,000 including all partners) with a response rate of 20%. Survey analysis will be conducted in collaboration with Michigan State University, EARTH University and Canadian partners McGill University, University of Toronto, and Simon Fraser University. Partners will continue to conduct in-depth interviews with their respective alumni in Africa and in the African Diaspora through spring and summer 2015, and expect to generate mixed methods results and recommendations for The MasterCard Foundation and other scholarship programs by the end of the year. 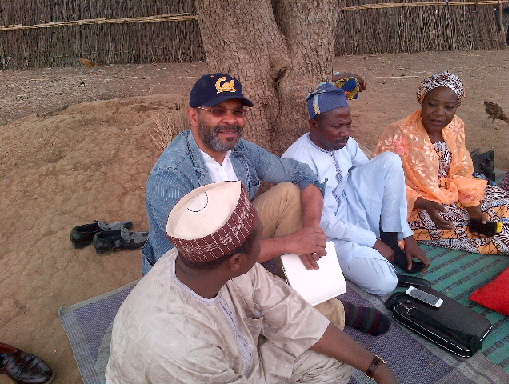 Daniel Mouen-Makoua (Cameroon) in Yola, Adamawa State, Nigeria, March 2015 (UC Berkeley Masters CEE 1986). For another story on the historic trip: Click here!